Sometimes you have to go off the beaten path to find paradise. Laos’ Vang Vieng has become legendary (particularly among backpackers) as a tourist trap for river tubing and over-the-top partying. 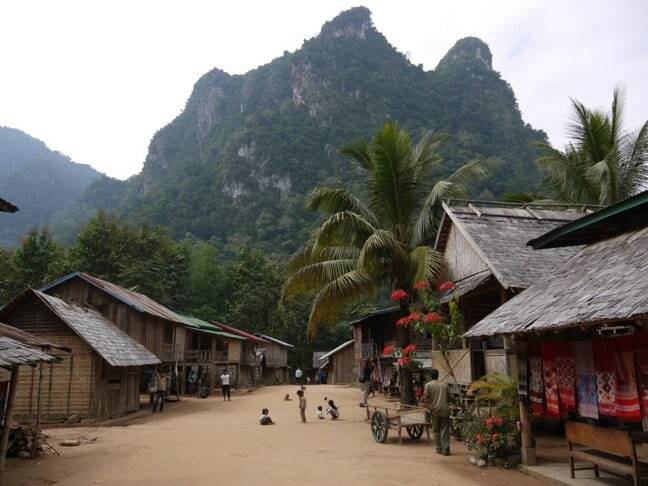 But not far away lies the sleepy village of Muang Ngoi, which is tucked into the mountains along the Nam Ou River. For us, it was a tranquil slice of heaven. There’s very little electricity here, no WiFi/phone access, and accommodations are sparse and basic. At first glance there seems to be nothing to do other than walk down the village’s dusty road past clusters of rickety wooden homes and chickens running at the heels of yapping dogs. Just getting here from Luang Prabang can be an ordeal: There are no vehicles, and access is by river only. We arrived not knowing what to expect, but wanting a peaceful retreat. We left with so much more. 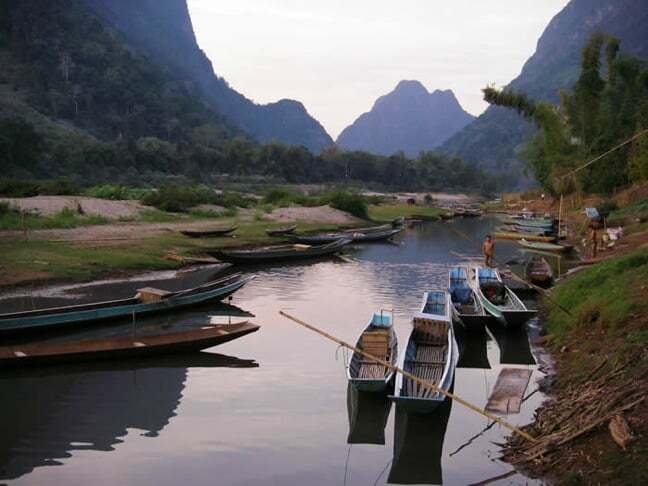 Unlike Vang Vieng, Muang Ngoi has no bars lining the river– just simple restaurants and bamboo shacks. 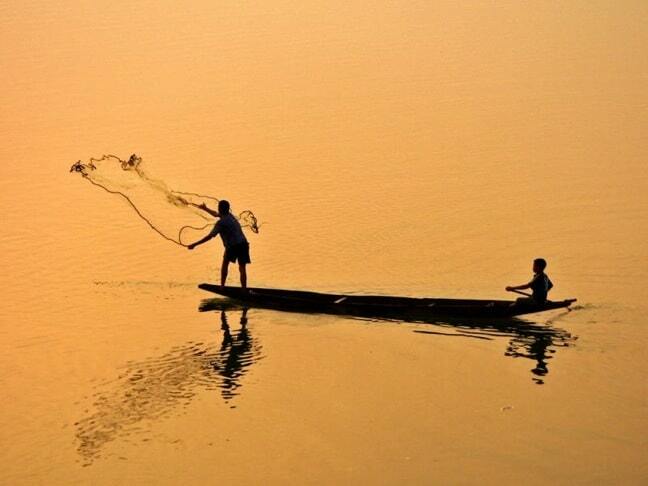 Instead of rubber tubes you’ll find traditional Laotian fishing canoes and circular nets. The palm trees remain the same, but here they frame spectacular scenery featuring dusty red roads, lush green jungle and the majestic Karst Mountains. The tiny town is home to about 800 people, only a few of whom can be found tending to their corner stores or ushering geese back into small garden plots. 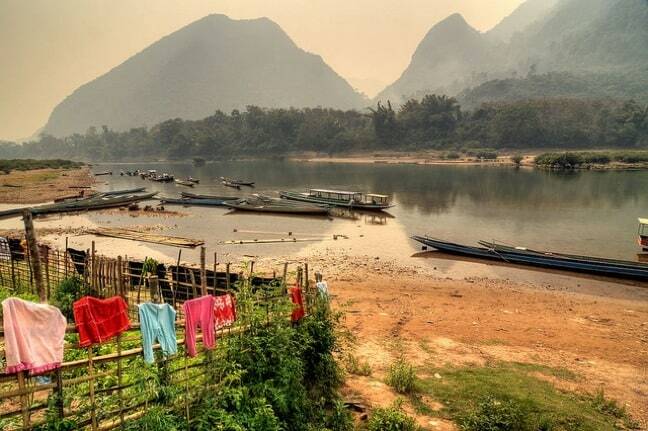 Perhaps the rest of the villagers have returned to the caves, where they lived for 10 years during the Vietnam War, when this tiny fishing village lay directly in the path of the Ho Chi Minh Trail. Evidence of past conflicts can be found throughout the village, with bomb casings propping up buildings and decorating restaurants and gardens. In less than an hour’s walk, you can visit two caves to get a sense of what life was like for the people of Muang Ngoi during those fearful years. Warning signs remind you not to stray from the path. Most tourists stepping off the long-tail boats stop at the nearest guest house, but we decided to walk a little further down the dusty track to give our business to those who remain hidden from the trickle of tourists. A doll-sized lady came hurrying out to greet us and, in broken English, asked us to stay with her. It was the simplest of accommodations, and her shame was evident when she apologized profusely for the lack of electricity, the bucket of water that replaced a shower, and the thatched hut so small it could barely squeeze in a double bed (which, thankfully, was draped in a mosquito net). I looked out at the panoramic view of the river and mountains before me. There was not a person, bungalow or restaurant to be seen on either side– only thick, verdant jungle. A hammock swung gently in the breeze on our balcony and I pictured myself in it, wearing a smile as wide as our host’s heart. Nuang Jan smiled and allowed us time to settle in before preparing a simple meal of vegetables and rice that we ate together by candlelight. Her husband darted in and out of the kitchen and various other sheds, cooking and cleaning offering a timid smile as we giggled and played with their two-year-old daughter. 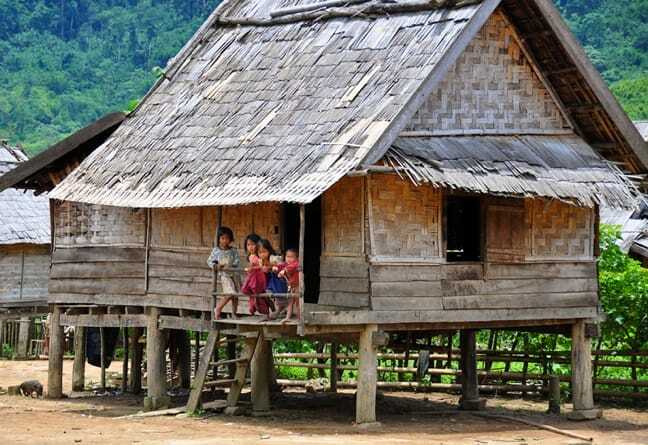 The following day her son, Gai, arrived from Luang Prabang, where he was studying. He spoke fluent English and became our translator, guide and friend for the week. Gai led us into the jungle across the river, through the rice fields and into the hills to a small H’mong and Khmer minority village. Each wooden home was immaculately cared for, with fences made from twigs separating them, the dusty ground swept neatly and flowers bursting with color in little garden plots. We were invited to sit with the Chief of the Village, husband to many and father of 15. A shot of Lao Lao (homemade rice whiskey) was passed to us, but it was mid-morning and stifling hot, so I hesitated. “It’s to chase away the evils spirits you may have bought with you,” Gai explained. I threw the drink down in one big gulp with a smile, ignoring the spinning of my brain and the churning of my stomach, satisfied in knowing I was cleansed and would not bring harm upon the village. I’m not so sure the villagers felt the same, as they poured in from the surrounding dusty lanes to stare at us. One small child, terrified, burst into tears. Later, we tried our hands at fishing, Laotian style. Gai took us out in his family canoe, which we held sturdy as he stood and slammed his 6-foot bamboo pole on top of the water in order to stun the fish and scoop them up. Knowing I wouldn’t be able to do this without falling in the water, I opted instead to tangle myself in the circular net while trying to throw it in from the riverbank. I have no idea how it worked, but when Gai threw it nimbly, he pulled up several small fish. Thankfully, we would not go hungry. Gai, who had only one arm, radiated strength and determination in everything he did. He was so proud of his remote village, and hoped one day to attract the number of tourists that Vang Vieng did. He was building his dream bar down one of the village’s side streets and showed us his workshop, where he cut every piece of timber himself with just one hand. With a scar across his eye and several on his stomach, it was obvious Gai had had an untimely run-in with one of the many pieces of war ordinance that littered the area around Muang Ngoi. We didn’t want to pry for his story, and you could tell he didn’t want to bring attention to his flaws. But we learned what happened later that evening, as we sat with his mother under a picture-perfect sky filled with shooting stars. Nuang Jan had entered a cave at age 8 and walked out again at 18, married, with a child on the way. The war that had already taken so much from her nearly took her son at the age of 11, when he stumbled upon a glinting piece of metal and his boyish curiosity got the better of him. Months later, Gai returned from the hospital with permanent scarring and only one arm. But he was also armed with determination that the accident would never define his life or prevent him from doing whatever anyone else could do. One of my strongest memories of our time in Muang Ngoi is how Gai stood proudly outside his bar, describing in detail how it would look once completed. He yearned to create a tranquil space where travelers could sit and have a beer, melting into the Laotian landscape under the shade of overhanging palms. At the entrance stood a 6-foot tall shell casing, and on the front he would paint the name of his bar. It was a powerful testament to the strength and resilience of his indomitable spirit. In Muang Ngoi, you will not find raucousness or all night parties. In fact, nothing can be heard after 9pm except for the noisy chatter of a rooster who seems to think he should go all night rather than just at sunrise.